We are LOVING blue room design ideas. And although we never thought we would say it, but we think grey may be at risk of being replaced as our fave colour by blue. With its ability to be both bold and subtle, contemporary and traditional, moody and light, blue just has a versatility that grey could never give us – hence why it is undoubtedly becoming one of the most popular decorating colours this year. It is bold enough to make you feel like you are being a bit brave, but classic enough so that you don't have to step too far out of your greige comfort zone. So whether you planning to go to big (think an entirely cobalt kitchen) or just want to add some small touches of this on trend colour to a bedroom or living room, we've got you covered with our round up of the best blue room design ideas. Find more design ideas and inspiration on our hub page. If you are fully committed to the cause then blue kitchens are oh-so desirable at the moment. 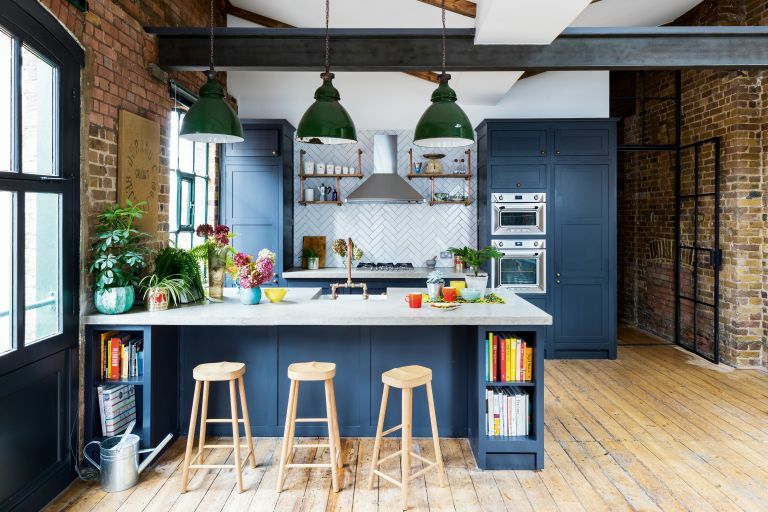 Pick any hue of blue and we are pretty sure you could make it work with all kitchen styles from classic Shaker to modern minimalist, but it's navy blue kitchens that we are particularly loving at the moment. The exposed brick walls, pops of bright colour and industrial accessories give this simple Shaker a kick of modernity. If you want to get this look on a budget, or just don't fancy ripping out your current kitchen, you can always paint your kitchen cabinets – just check out our step-by-step guide to painting kitchen cabinets. Find the best paint for kitchen cabinets in our guide. Feeling blue about your colourless kitchen? Paint is your friend when it comes to quickly transforming your space, quickly and relatively cheaply (especially if you can tackling painting a kitchen yourself). Too replicate this clean, crisp style pick a vivid blue – something like Farrow and Ball Stiffkey Blue , add a heavy helping of white (check out our white kitchen ideas for inspiration) and some zesty yellow kitchen accessories for a the dreamiest of colour combinations. Find more inspiration for your scheme with our dark kitchen paint design ideas, too. If your style in more light and airy than dark and atmospheric, take note from this kitchen and choose the palest shade of blue to paint your walls – something like Benjamin Moore Winter Ice would work perfectly. Just make sure you throw in a few slightly darker hues or some bright colours (love how the apple green works here) to stop the space looking too saccharine. If you love this kitchen, make sure you go and check out more of our (grown up) pastel decorating ideas. Ooft this kitchen is giving up all the French farmhouse/slightly Mediterranean/holiday home vibes and we love it. Best thing about the room (apart from those exotic looking bottles of booze) has got to be that ceiling! It's almost got a rag paint effect, but we think your could recreate the authentic, paint thats been here centuries effect, with some trusty chalk paint. Try Annie Sloan Greek Blue for a similar colour and then go and follow our step-by-step guide to painting a ceiling to find out how to DIY this look. While paint is obvious choice for adding blue hues to your home, wallpaper can be more interesting way to get in those inky colours. Floral wallpapers may remind you of ancient hotel bathrooms and your grandparents' living room, but we promise they are making a comeback! Just be sure to choose a large scale pattern that's not too fussy – case in point, this print from Sandberg. For more proof that florals are back check out these floral room design ideas. Not planning a beach holiday this year? Chill, you can bring all the beachy vibes to you. Switch out your cushions to some blue striped variants, upcycle your furniture with some blue chalk paint, dot around some sea-themed accessories (just please no miniature ships in bottles) and you are good to go. Sorry we couldn't get through a gallery without mentioning how you can work in blue with the Scandi trend. But dark blues really do work with a lot of the key elements of Scandi style – particular New Nordic design ideas – the light wooden, slimline furniture in particular, as beautifully demonstrated below. For similar furniture go and check out John Lewis' Croft Collection and for a similar blue paint we recommend Farrow & Ball's Hague Blue. The right shade of blue can work just as well in a traditional space as a modern one, as perfectly demonstrated by this living room. Pick out a fresh mid-toned blue like Farrow & Ball's Lulworth Blue, which despite its boldness doesn't overwhelm a space, and pair it which contrasting wooden pieces and touches of burnt orange. Find more great living room colour schemes in our paint design gallery. Yellow and blue may sound like a daring colour scheme, but it needn't be reserved for the minimalists amongst us. Take a tip from this lovely living room and choose more muted hues. A sea foam green and a pale lime-toned yellow work together beautifully, especially with a healthy dose of off white and some dark wooden accents thrown in. We have loads of tips on how to use a colour wheel for interior design in our guide. North facing living room? Despite it being a cooler tone, a light blue colour scheme could be your best bet as, it goes without saying, using pale colours in a light-deprived room can make it look brighter. We love how the print of Cole & Son's Cow Parsley is subtle enough so you can still incorporate other patterns into the space (note the striped cushions), so despite there being a very clear colour scheme here, the room doesn't look too matchy-matchy. Colour blocking is still going strong, and we are totally okay with that. It's such an easy trend to DIY and can completely transform a space. You don't have to go crazy with loads of colours either, here Annie Sloan's Duck Egg Blue has been used as a neutral background for the vivid Napoleonic Blue . For more colour blocking design ideas make sure you check out our feature. We are big fans of murals. One up from wallpaper, these large-scale designs have a really dramatic impact. Pick out a mural that will guide the colour scheme for the rest of the room – in this mural from Designers Guild, blue is obviously the key colour, but the hints of green and pink give you a ready made pallet to start designing the space around. Despite the traditional print, the vivid cobalt blue bedding and the bright, boho style cushions give the room a chic contemporary vibe. For more glorious mural design ideas head over to our feature. Painting floorboards is a super easy way to update a room on a budget – especially if you have the time to tackle the job as a DIY project. If you love a clean crisp scheme but are itching to play with a brighter colour, your floorboards could be the perfect canvas to experiment on. Choose a bright clear colour like Farrow & Ball St Giles Blue, as seen below, for a really fresh look. For tips and tricks, plus a ton of ideas, check out our guide to painting floorboards. Switching up your bedding is probably the easiest way to bring this on trend colour into your bedroom. Layer up all the cool toned blue pillows, blankets, throws and cushions to create a really calming sleep space. You could also invest in a blue headboard to make the colour even more of a focal point in your bedroom. Tie to whole look together by adding matching accessories throughout the space. Not ready to commit to four blue walls in your bathroom? Take a cue from this gorgeous bathroom and and go halfies, painting the bottom portion of your walls in the beautiful Inchyra Blue from Farrow & Ball. Find more bathroom paint ideas in our guide; and don't miss our best bathroom paints buyer's guide so you can be sure of choosing the right finish. You could also use your window treatments to bring blue into your bathroom. Colourful plantation shutters make a great alternative to a feature wall in a small room, like a bathroom, and are ideal for creating a focal point. We love how in this bathroom the diddy freestanding bath perfectly matches the shutters and the graphic print rug in a deeper shade creates just the right amount of contrast. Convinced you you immediately need shutters in your home? Check out our guide to choosing window shutters. Find more bathroom window treatment ideas in our guide. if you are doing up a bathroom on a budget, you could easily add just a pop of blue by painting the inside of your bathroom door. It's a super quick weekend project that could make a big difference to your space. If you have a bit more of a budget, pick our some tiles (or some very convincing vinyl flooring) that has touches of blue to match your newly painted door. We have loads of tips on how to paint doors over in our guide. Want to fully commit to the cause? An all blue bathroom really can have a striking effect. We would recommend giving this a go if you have a large, light, airy bathroom that can handle the colour. If you are designing a small bathroom, by all means go for it, but maybe keep the ceiling and the floor light and pick out white sanitaryware to provide some contrast. Use a few different tones of the same colour to create a calming, cohesive hallway. We love how a darker blue has been used on the woodwork in this hallway, but the walls have been kept a lighter colour that really lengthens the space. The blue floor tiles bring the whole look together, and that pop of yellow? Perfection. Get inspired by more gorgeous hallway paint colour schemes. And check out our buyer's guide to best paints for hallways for some really tough finishes. Blue is known for its calming, stress reliving qualities, so it just makes sense to incorporate it into your home office. Painting floating shelves the same colour as the the walls stops small rooms (which most of our home offices are) feeling cluttered and keeps the space looking more open. We have a load of small office design ideas if you are after more tips.